Over three million people travel by air every day, but do the 10,000 aircraft in the skies as you read this represent a ‘golden age’ for aviation? Surely that belongs to the period between the two world wars when airships – the world’s first passenger airlines – cruised around the skies conducting both luxury tours and scheduled services. That was until New Jersey’s Hindenburg disaster of 1937 crushed public confidence in airships, and they sank into history. Airlander 10 is ‘the world’s biggest airliner’. So what’s changed since 1937? Back then airships used highly flammable hydrogen, whereas now they rely on helium, which is completely inert and safe. “It’s also about modern materials and fabrics – the old 800ft airships had metal lattice works internal structure,” says Hwfa Gwyn, Chief Financial Officer at Hybrid Air Vehicles (HAV), which has created the Airlander 10. At 92m long, Airlander is still bigger than a Boeing 747 and can fly for as much as five days without landing. “We can fly three times further than a helicopter and carry many more people – 50 instead of 16 – in the Airlander 10, and do it for about a third of the cost,” says Gwyn, who describes it as a “weightless plane” that gets 100% of its lift from that helium gas, which expands as it rises, and is completely safe. “You get a greater lift from hydrogen, but because of the risk we’ve never used it,” he adds. To fill Airlander 10 with helium costs about £250,000, with only about 25% of it lost each year. From next year Airlander 10 will be used for advertising, geo-surveys, offshore movement of people, delivering up to 50 tons of humanitarian aid or commercial cargo, coastguard search & rescue and, of course, by the military for ‘eye in the sky’ surveillance. Flying Whales’ LCA60T uses graphene-based ultracapacitor batteries. It can take off vertically and travel at up to 100 kilometers/hour (or, at least, it will when Flying Whales launches a prototype in 2019). “We’re designing the LCA60T to be able to deliver a wind turbine to the side of a mountain, help transport electricity pylons or pre-fabricated buildings across undeveloped terrain and transport large aircraft components from one supply chain location to the next.” says Sébastien Bougon, CEO of Flying Whales. The project is primarily for the French timber industry, though it’s also funded by the China Aviation Industry General Aircraft (CAIGA) company. The rigid-frame LCA60T also has a rather special electric propulsion system that uses graphene. Its hybrid electric power system uses graphene-based ultracapacitors – batteries – that give the airship a boost when it needs to hover, lift cargo, and stabilize itself in bad weather. “Our ultracapacitor technology driving the airships’ electric power systems will ensure maneuverability and control, such as vertical take-off and landing ability, which will be vital for heavy-lift industrial applications,” says Taavi Madiberk, CEO and co-founder of Skeleton Technologies, which manufacturers the graphene-based ultracapacitors. The LCA60T could be used for building houses in remote areas. Aircraft need runways. While it’s hard enough for busy airports to get permission for extra runways, it’s even more difficult to construct them in remote areas. 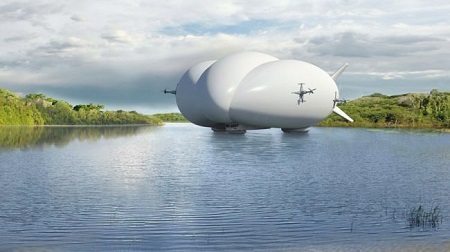 That poses problems for companies wanting to work in areas without roads, rail or navigable rivers; airships could make it possible to more easily mine for important metals and minerals, harvest trees, or build houses, wind farms, solar panel plants or construct electricity pylons in off-the-beaten track regions. 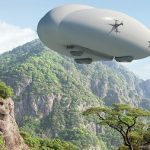 Airships could also be used to bring communications to disaster-struck areas, or even to float extra mobile masts above Glastonbury Festival or sports stadiums. 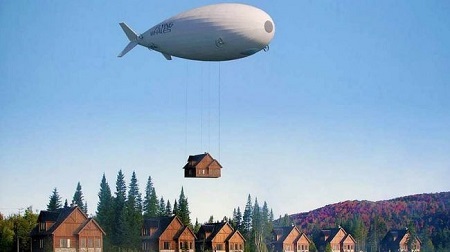 “It wouldn’t rival something like Google’s Project Loon – that’s about low-cost internet – but for short-term, high value connectivity, Airlander10 could work very well,” adds Gwyn. The LMH-1 uses air cushions to land on anything. 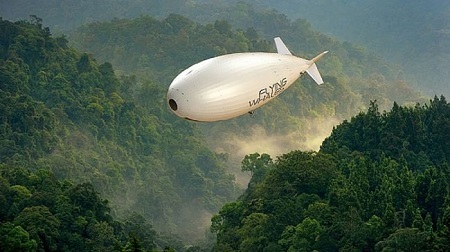 Although its Skunk Works plant in California has so far only produced a smaller prototype – shown at the Paris Air Show – Lockheed Martin claims that its LMH-1 Hybrid Airship will stretch to 91m and carry 23 tons of cargo – as well as 19 passengers – while also burning less than one tenth the fuel of a helicopter per ton. Because it uses air cushions to land, the LMH-1 can land on rocky areas or even on water, so it’s well suited to rough areas. The LMH-1 is being sold by Hybrid Enterprises. It’s planned for 2018. 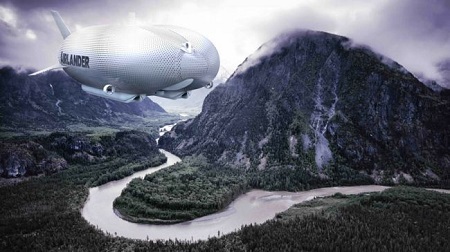 Zeppelin already offers short pleasure flights in airships from Friedrichshafen, Germany. As well as Flying Whales, Lockheed Martin and the Airliner 10, there are rival airships in development in Russia and Brazil. RosAeroSystems is promising the Aerostatic Transport Aircraft of the New Type (ATLANT) hybrid cargo-and-passenger airship, which takes off vertically and is being touted for VIP tourism and as an ‘air yacht’, though also as a way of transporting 60 tons of cargo up to 2000 km. 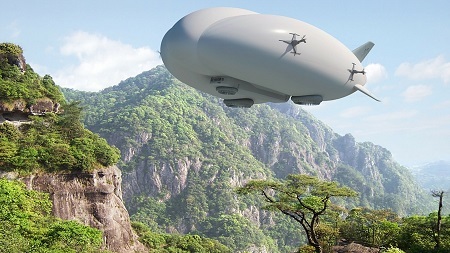 “Airships have different flight properties and flight dynamics, but the uses for airships will be as varied as they are for fixed-wing aircraft,” says Gwyn, who expects a £50 billion market across the next 20 years spread across commercial and military markets. “But the first uses are likely to be in leisure and advertising.” If you want to get ahead of the curve you can take a short flight in a Zeppelin now in Friedrichshafen, Germany. This entry was posted in Airships, Blimps, Dirigible, Hybrid Airships, Semi-Rigid and tagged Airlander, airship, Airship do Brasil, blimp, dirigible, Flying Whales, Friedrichshafen, goodyear, Hybrid Air Vehicles Ltd., hybrid airship, Hybrid Enterprises LLC, LCA60T, LMH-1, Lockheed Martin, P-791, RosAeroSystems, zeppelin. Bookmark the permalink.